Capt. Tom's expansion to four boats has succeeded thanks to the strength and experience of his crew. Capt. Tom has put together one of the most impressive fishing teams on the East Coast. All of his captains have fished the Nantucket's waters since they were children and they average 15 summers of guiding on Nantucket. Jamie Vaughan for example, our youngest captain, has been working in some capacity for Capt. Tom's Charters for 6 seasons, but as a Nantucket native, he still shows his more seasoned colleagues a few new tricks every year. Nat Reeder, by comparison, is now entering his 24th year with Captain Tom. While Capt. Tom readily admits that he learns new tricks from his experienced fishing colleagues, he is quick to point out that as strong fishermen as they are, that their true strength is with people. For the past 35 years, Capt. Tom's Charters has prospered due to one driving principle: This is a people business. Our goal has been to always show people a good time and have them leave the boat with memories that will last a lifetime (or at least until they have the opportunity to fish again!) 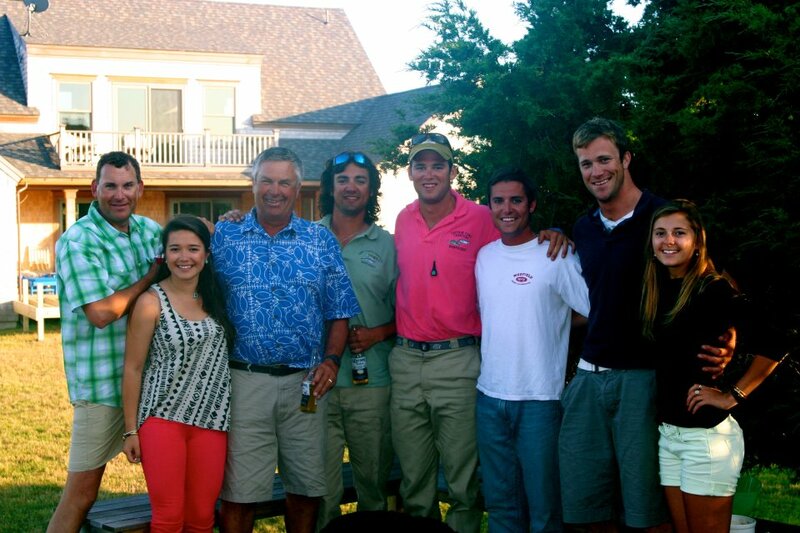 The ability and experience of our crew, combined with the fertility of Nantucket's waters, ensure top quality fishing. What has always set Capt Tom's Charters apart from the competition, however, is his devotion and ability to create unforgettable experiences for his clients that encompassed all of what a Nantucket fishing trip should be. This has remained a top priority with Capt Tom and his entire crew. Our obsession for the ocean and the fish that swim within it keeps us fishing, but our strength as a team and what keeps our clients returning year after year is our shared passion for the people we fish with. Our shared passions and abilities allow us to offer incredible experiences for a wide range of anglers. Capt. Tom's Charters hopes that you will take the opportunity to enjoy Nantucket's famed fishery with Capt. Tom's team. We hope that our experiences will become your experiences. We love sharing our stories, we look forward to hearing many of yours, and we cannot wait to create some new ones.